Cubase Studio Pack, General Sequencer from Steinberg in the Cubase Studio series. Steinberg introduced Cubase Studio Pack, which comprises the music production environment Cubase Studio 5 and the CI2 USB interface/controller. By purchasing this bundled deal, Steinberg says Cubase Studio Pack saves customers almost 20% off the regular priced purchases. On offer as long as supplies last, this limited summer special is available from certified Steinberg dealers in selected countries*. 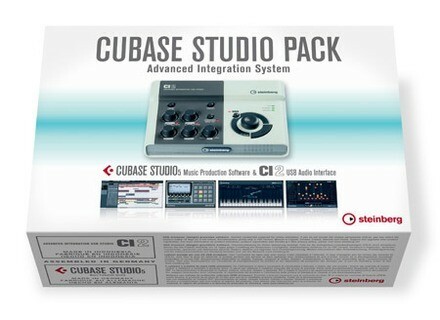 Alternatively, order Cubase Studio Pack directly from the Steinberg Online Shop. Cubase Studio 5 offers tools for composition, recording, editing and mixing, with features such as VST Expression and VST3 instruments and effects, like the new Groove Agent ONE drum machine and Beat Designer step sequencer as well as the PitchCorrect intonation effect. CI2 is interface and controller in one, providing two mic preamps with +48V and a single HI-Z as well as a controller section featuring the AI Knob — all integrated into Cubase to assist the user during the production process. Orange Tree Samples Evolution Electric Guitar Evolution Electric Guitar is designed to enable keyboardists to create "authentic sounding" electric guitar parts without hand editing of MIDI. Peace Love Productions Total Tech Grooves 1 & 2 PLP and Wolsfraektroes Music team up to bring you Total Tech Grooves 1 & 2. Producer Loops Progressive Trance & Electro Vol 1 "Progressive Trance & Electro Vol 1" from Producer Loops brings 5 construction kits combining Trance with side-chained Pads and Synths also suitable for Electro.